After a successful inaugural race at Eastern Creek the electric motorcycle teams are back for round two of the eFXC / TTXGP Australian electric motorcycle grand prix. This time the bikes were more evenly matched and the riders were only seconds apart. We catch up with Malcolm Faed, our newest scrutineer from Australia as he turns his hand to race reporting... with a little help from Andy Marsh whosenuts and bolts video report shows the ingenuity and determination of the enthusiasts that make this event possible.. 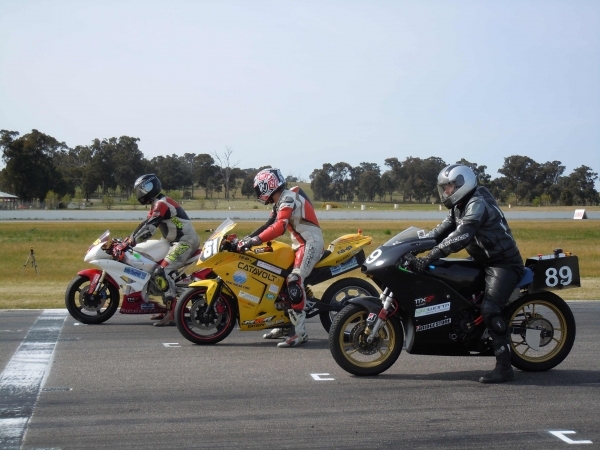 Round 2 was held at Winton Raceway, in Victoria from the 2nd to the 4th of September 2011. Riperton Racing. TTXGP Owner / Builder / Rider Daniel Sailer. Voltron. TTX75. owner / Builder Rider Chris Jones. There were 2 races over the weekend on Saturday and Sunday. In a surprising twist to his usual speed and reliability, Daniel Sailer on the Ripperton entry failed to get off the line from his pole position start and it was left to Voltron’s Chirs Jones and Catavolt’s Jason Morris to fight out the race for the win. The two diced and swapped positions many times during the race with Voltron’s straight line speed giving them the edge on the straights allowing them to pull a gap in the second half of the circuit, only to have Catavolt’s better handling machine and late braking catch and pass them in the technical part of the track. Sunday morning greeted the riders with some light rain and it looked as though the electric bikes were going to have their first ever wet race, however by lunch time the heavens had cleared and race two was to be run in perfect cool sunny conditions. Unfortunately Daniel Sailer of Ripperton was unable to sort out his technical issues overnight and had to withdraw from the meeting, so once again this meant that Voltron and Catavolt would tussle for the not only the win, but the overall championship lead. Off the start Catavolt’s Jason Morris knew that if he could get in front by the start of the technical section , then he would be in a good position to hold off Voltron for the remainder of the race. However Voltron’s straight line speed was their clear advantage and Catavolt had to settle for second place. Race 2 was also won by Voltron in 14:05.3, fastest lap 1:58.2, followed by Catavolt with 14.18.7 and a fastest lap time of 2:00.1 Both teams improving substantially for the second race. From a scrutineering perspective, the event went smoothly. 2 safety personnel briefings were held. One with the crash crew, the other with the ambulance staff. Both groups were happy with the detail provided and precautions in place. Some even visited the electric bike pit area to learn more about the machines. All safety checks passed on the bikes before qualifying began on Saturday morning. I have observed throughout the 2011 series that the public and teams are getting used to the bikes being around. They are more interested in learning about the technology and the capabilities of the bikes. All going well, there will some be some additional competitors next year as a result of the promotion of the bikes and event by the teams. I joined the commentators for Sundays race. They were both genuinely impressed with the bikes and technology. This is the beginning of a gradual revolution in motor racing, at the bleeding edge of development compared to petrol bikes and they are excited to be a part of it. Results and commentaries are available from eFXC direct by clicking on the green links. With their second place wins, Catalvolt take the lead in the TTXGP Australia Championship going into the third and final round in the 2011 series; held at Wakefield Park raceway on the 8-9 of October where we are hoping to be joined by some additional competitors. The results here will be interesting as benchmarks were set during the test sessions in April/May.